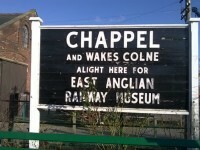 We have visited the East Anglian Railway Museum many times over the years due to it’s hosting the Chappel Beer Festival in September (and more recently a Winter Beer Festival as well). When our children were small (some 20 years ago!) we did visit to ride on the steam trains and to see Thomas the Tank Engine and his friends when they paid a visit, and had a great day out. Our latest trip to the museum was to the 6th Chappel Winter Beer Festival and you can read about the beer festival here. On this trip though we were amazed to see how much work has taken place over the last year or so to develop the museum. The idea is to make sure that there is something of interest for all the family on a trip to the museum, not just for the train buffs. There is now a lovely little row of shop fronts, which include a beautiful vintage haberdashers, a sweetshop and an ironmongers by the name of “Fork ‘Andles” – someone was a Two Ronnie’s fan (and there are real shops of that name in nearby Earls Colne and Coggeshall). The old booking hall has been staged, with a railway clerk ready to sell you tickets, and the original W H.Smith’s kiosk has been filled with period magazines. There was also a very interesting exhibition on the role of the railway during the First World War, with a particular emphasis on Chappel. The Restoration Shed is full of engines in different stages of restoration, and is a fascinating place to wander around – even if you’re not a train buff. I spoke to one of the volunteers who said that some of the carriages had been under going restoration for upwards of twenty five years – clearly it’s a labour of love. In the field which many years ago was an orchard, there is now a heritage centre. However, it’s never been open when we’ve visited, so I’m not sure what it’s like inside – but I imagine that it is used for school trips. And now there is a well stocked shop with all the usual gifts for children, and a little tea and coffee shop for some light refreshments to welcome you to the museum. Watch out for their regular events, on our monthly listing pages, and here are a lot of photos to give you an idea of what’s on offer!